On it’s own, this probably our highest holding product. As it’s name implies, it works by binding individual hairs together to thicken and shape the hair in place all day. Yet unlike its name implies, it washes out easily with water. High Hold, Matte Finish, Water Soluble! Water/Aqua/Eau, Lanolin Wax, VP/VA Copolymer, Beeswax/Cera Alba, Tribehenin, Bis-Diglyceryl Polyacyladipate-2, Cetearyl Alcohol, Petrolatum, Ozokerite, Vinyl Caprolactam/VP/Dimethylaminoethyl Methacrylate Copolymer, Ceteareth-20, Alcohol, Denat. A unique combination of 4 mineral, plant and animal waxes (Ozokerite, Tribehenin, Lanolin and Cera Alba) chosen for their ability to deliver flexible hold. 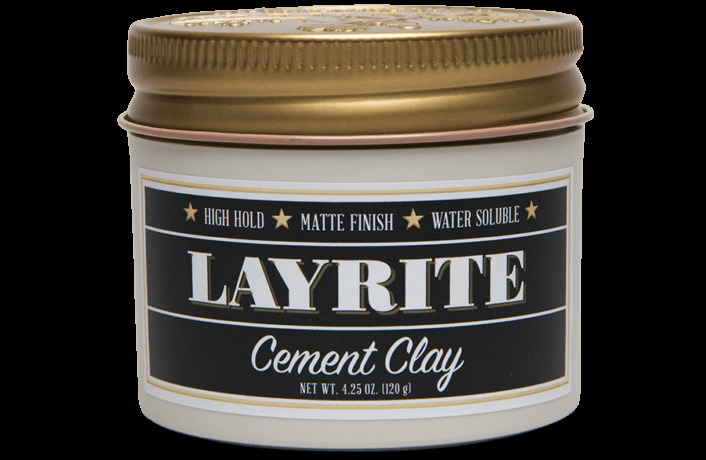 Layrite Cement controls frizz and gives definition and separation when warmed and applied lightly. To control cowlicks and frizz, smear a tiny amount on the end handle of a rat-tail comb and “brush” down stubborn areas. It’s extremely strong hold is perfect for people who like to “mess with” their hair all day. Its subtle hint of shine gives your hair a more natural appearance than most other matte products. 2 - Distribute evenly through damp or dry hair and style / shape as desired. 3 - Run fingers through hair to reshape - no water needed. 4 - Rinses out easily with shampoo and water.